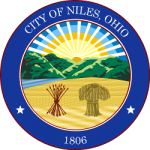 President of Council – Barry Steffey, Jr.
All taxpayer assistance is offer through RITA for the City of Niles. For any additional help or information, please visit the RITA website or call their self service line at 1-800-860-7482. Self-service phone options such as making a payment, checking refunds and estimates are available around the clock or you may speak with an agent during business hours, 8:00 am – 5:00 pm Monday – Friday. RITA offices are closed and agents are unavailable during certain Holiday and Office Closures. RITA offers walk-in taxpayer assistance events, hosted throughout the state of Ohio.